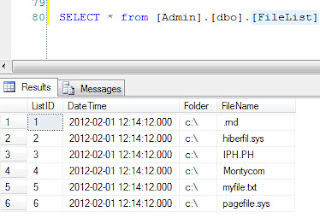 A Recent challenge about how to get the folder's list of files int oa SQL table for file comparision. I create a table called "FileList" under my test database called "Admin"
I'll use the below script in a script task in SSIS. SQLStr = "INSERT into FileList(DateTime,Folder,FileName) VALUES ('" + Now() + "','" + di.ToString + "','" + f.ToString.Trim + "')"